Regular tree inspection by a certified arborist is one of the easiest ways to prevent expensive long-term damage to trees, plants, and property. Unfortunately, by the time you see visual evidence of damage to a tree, it’s often too late to address the problem. At Lewis Trees, we are experienced with issues like structural defects and hazardous conditions. With over two decades of experience handling everything from small local jobs that involve one tree to entire commercial properties that require regular upkeep and monitoring, we take on jobs of all size, no matter how big or small. 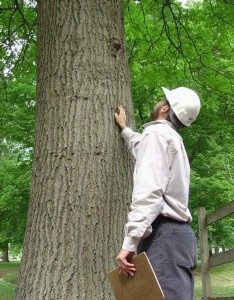 Whether you need one tree inspected, or an overall assessment of an entire property or project, we have the experience and knowledge to handle the job! Need some basic info about the early detection of issues affecting tree health? This resource provides a nice overview of what you should see when a tree is healthy and thriving. In some cases, all that’s required is pruning or tree trimming to ensure that the tree has the necessary space and access to nutrients that will help it flourish. Other times, an inspection may reveal that there is a structural issue with the tree, which can be addressed with cabling or bracing to stabilize it. Another potential hazard that can be discovered is unhealthy soil, which can be particularly problematic. The three factors mentioned above are all integral to the providing a healthy atmosphere in which trees can develop healthily and naturally, all of which can be quickly and easily diagnosed by the trained eye of an experienced arborist. Do you need a tree or trees inspected in Santa Cruz or Monterey? Call us today at (831) 508-8995 to learn more about how we can help or if you’d like a FREE cost estimate! We’re happy to answer your questions or offer a FREE price quote–no strings attached!